Merry Christmas to Africa … and beyond! Mama would like to wish Christmas blessings to all of our friends celebrating this beautiful holiday from places like Egypt, Eritrea and Ethiopia to Russia. Armenia or Georgia! Yes, I said Merry Christmas. 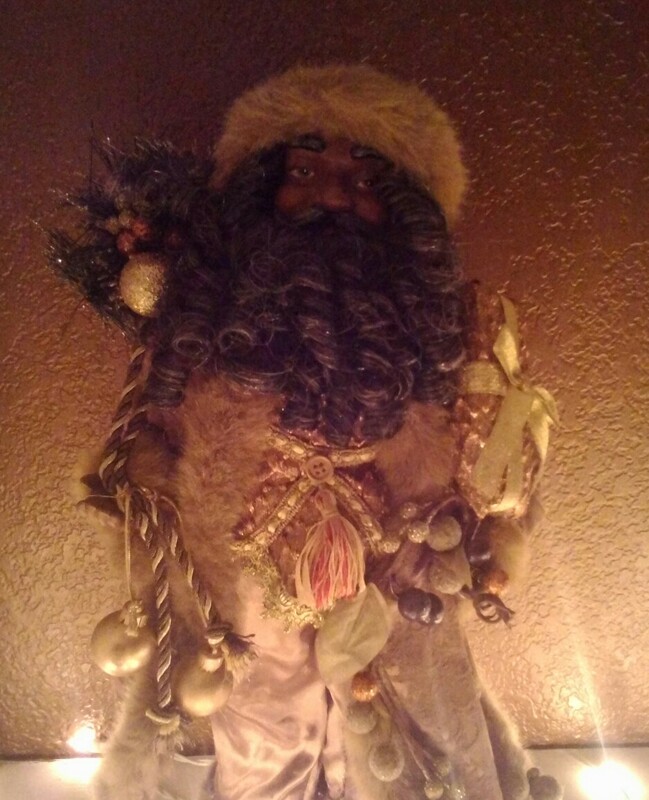 Many people in the West have no idea that after everyone has boxed up their decorations and put their Christmas trees on the curb; millions of people in Russia, Greece and East Africa are celebrating Christmas. Technically, the two churches both celebrate Christmas on December 25th; the difference is in the calendars they use. When many switched to the Gregorian calendar, some parts of the world decided instead to keep the Julian calendar, which explains the 13 day difference between the commonly accepted December 25th date and January 7th. So, for many Coptic and Eastern Orthodox Christians, today is Christmas day! The day will be filled with incense burning in churches, big meals shared with family and friends, the exchange of gifts and lots of good cheer. If you would like to tell us more about your Christmas traditions, we’d love to hear more in our comments section below. Again, Merry Christmas to all of you celebrating today, wherever you may be! I was in Los Angeles a couple of weeks ago and while there, visited one of my favorite little places to shop. Since you probably already know that I’m a real food lover (I still feel odd saying “foodie”), of course it’s related to where I can buy what I love most: cooking ingredients! Since I happened to be in LA on some other business; I took the occasion to make my way down to Papa Cristos Greek restaurant. So, why on earth, you are certainly asking yourself, would I find myself so excited to go to a Greek place? Well, because I do love Greek wines, baklava and Eritrean food. Yes, I said it: Eritrea is (almost) in Greece. So, let’s return to LA: There is a section of Los Angeles called “Little Ethiopia”. It is home to many Eritreans and the largest population of Ethiopians in the United States. 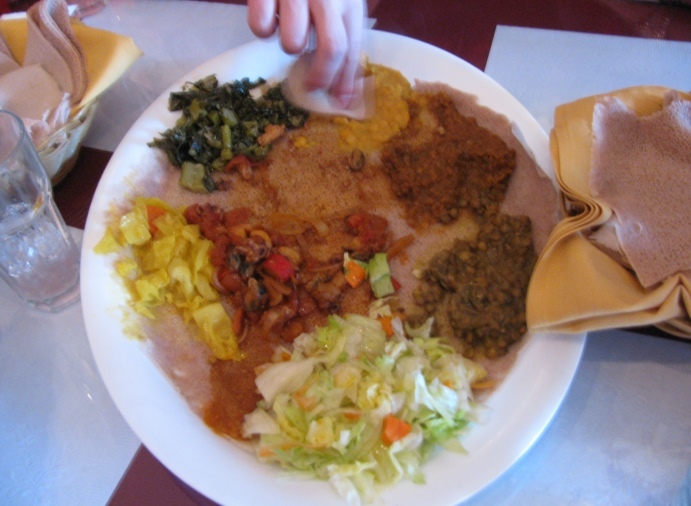 It is a great stop if you want to have a taste of Ethiopian or Eritrean cuisine. I highly recommend the Nyala Restaurant on Pico if you decide to pop into the area. They are famous for their lunch buffet. But back to how Greece meets Eritrea… You see, the first time I realized that the connection isn’t automatic for a lot of people is when I first took a friend with me to Papa Cristo’s to pick up some injera (a soft sourdough “pancake” of sorts that is used to eat most Ethiopian and Eritrean dishes with). She looked at me completely perplexed when we entered the place and asked the obvious question: “WHY on earth would this Greek guy sell African foods?” I then had to explain to her that we were related in many ways. Eritrea used to be a part of the Greek sphere of influence, we have traded for centuries and our foods reflect that, (as I’m sure would our DNA, if anyone bothered to check). Eritrea’s name comes from the Greek name for the Red Sea coastline “Erythra Thalassa”. Queen Cleopatra of Egypt was from the Ptolemy family of Greece, not a woman of African or Arab descent, as many tend to imagine her. And, since the Nile River flows north to Egypt, much trade was done in both directions. Thus, ancient Greek archeological sites can be found in both Eritrea and Ethiopia. This river has connected the peoples of the Mediterranean Sea to those in the Horn of Africa for ages. After all, where there is water, there is commerce. And, where there is commerce, there is an exchange of ideas, cultures and faiths. Let’s compare cultures for a moment: Greece: Greek Orthodox Church, Eritrea: Coptic (Orthodox) Church. Greek food has a particular flavor profile which uses: fenugreek, oregano, ginger, cumin, turmeric… Then you come to Eritrean food where you meet those same flavors again. It’s all about the way in which they are blended and in what proportions. Lamb? Yes, we both eat it. At the end of the day, the climates are the same and so are many aspects of the cultures. Where food is concerned, Eritreans have much more in common with Greeks than we do with Senegalese or Namibians. And Greeks have more in common with an Ethiopian Copt where faith is concerned than they do with fellow Europeans in Norway or even Catholics in Ireland. So, for me to walk into Papa Cristo’s store, it makes complete sense that he’d have incense burners, tiny coffee cups for our coffee ceremony, containers stacked high of spices we use for cooking and yes, even injera made by a local Ethiopian lady who runs a business from home. Greece and Eritrea have always felt like cousins to me. We might speak a different language and look a little different; but even that isn’t always the case. But for my friend, as well as many others that I’ve had conversations with in the past… it is a healthy reminder that European influence in Africa didn’t start with colonization. We’ve been trading together, praying together and eating together for eons before that nasty turn of events. And, I have faith that with good will and a clear understanding of history, which is then put in its proper context… we’ll be working together to create a mutually beneficial experience for a long time to come. Not because of politicians or debates in the United Nations. But because of good hearted people who reach out to each other with sincere interest and good will. Papa Cristo is a man who is short in stature, but big in heart and personality! His father founded the store over 60 years ago with the idea of bringing a little of his homeland to Southern California. Considering his proximity to the Little Ethiopia neighborhood, they slowly added Eritrean and Ethiopian products to their list of wares. It was a brilliant move considering there is so much cross-over of flavors. If you think of Greek cuisine, you think of a few different spices and herbs off of the bat: Cumin, turmeric, fenugreek… all of which are also used in Ethiopian and Eritrean cuisine. Greece is tied to both of my cultures, Italian and Eritrean with a pretty tight knot. Thus, it isn’t surprising that I feel at home among the olive oil jars, baklava and loud voices greeting one another as people come through the door. It is so typically Mediterranean and despite Eritrea lying on the Red Sea, it is a nation with a large Mediterranean influence and feel, due to decades of influence from Greece and Italy. It’s amazing how many people think of Africa as a dark continent first discovered by colonists in the late 1800’s. When, in fact, we have had a rich common heritage for centuries before that. We’ve shared queens, spices and art for ages. We’ve been sending our vessels over the seas to trade, we’ve intermarried and yes there were even African rulers of the Roman Empire. Africa and Europe, especially southern Europe have a common history that dates way before the Portuguese mimicked and greatly expanded the Arab method of slave trade. And I suspect that our futures are tied as well. 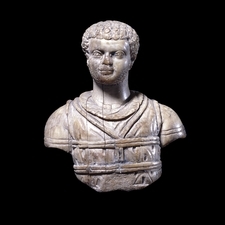 So, the next time you hear people oversimplify the relationship between the evil white Europeans and the poor African victims… remember me sitting among the Greeks and buying freshly made injera, remember Cleopatra of Egypt- by way of Greece, remember the Roman emperors and generals who were of African heritage. My mantra here on the blog is “Dialog matters”. Well, honest, open dialog about our cultures and history is a part of what matters most. Often, we find that as often as it opens the door to discussions about our past and current wounds… it also reminds us of our commonality. So, let’s use this space as a place to keep the dialog going! I anxiously await your comments. This video has a list of things I love: sustainable energy that actually produces results, education, information exchange which serves to make African countries self-sufficient AND women from Kenya… what’s not to love? I’m certainly no numerologist, but I do know that the number 100 has significance in many cultures. And even if I’m not a Korean mother preparing to celebrate her baby’s “100 days”, nor a biblical scholar counting the chapters in the Epistle of Paul; it has significance to me. Because this, my friends, is my 100th blog post! I was tempted to do what you probably expect I would have done: become nostalgic and write about how much I’ve enjoyed blogging, been inspired by those who have joined me at Mama’s Round Table and loved getting to know my readers better through our contact via comments left on the blog or social media like Twitter or Facebook. Of course, I feel all of those things. But, I’m not going to write about them. Don’t think for a moment that it means I’ll be posting here less, because I won’t. Africa is my priority, and will always remain so. I am still absolutely dedicated to doing what I can to improve the lives of African women and children: from Ghana to Eritrea, from Tunisia to South Africa. I wrote a few blogs last summer about a few of the connections between Europe and Africa. But, if you are a history buff, you already know that the ancient Greeks and Romans have strong ties to Northern Africa. If you love to cook, you know that spices and recipes have crossed the Mediterranean for ages and that the culinary influence between the two continents is strong. The Roman Empire had a black African Caesar, Egypt’s strongest, wisest leader, Cleopatra was Greek… the historical connections are endless. And, they aren’t just about Europe colonizing Africa either. Yes, there are still negative effects of that terrible period. It is undoubtedly a subject worth covering; but I feel that the subject matter is already well covered. I would like to focus on the positive connections without overlooking the negative effects. Not only because of dear friends like Tomás, clearly a European with a love and passion for Africa that is absolutely undeniable. But also because I think that all peoples have a story that is worth hearing. We now live in a world where we are as likely to have a friend in Kenya as in Korea, where people travel across the planet for business or pleasure and where we can log onto our computers and talk to our grandmother or cousin nine time zones away while seeing their beautiful smile. I’m looking forward to the adventures ahead with my new blog; but I’m equally excited about the next 100 blog posts here at Mama Afrika’s World. I’m working on a few really interesting posts and have some great interviews lined up, one of which is a follow-up with a guest many people have asked about, Nigel Mugamu. Thanks to everyone for your support and interest! I returned from my European trip about a week ago and am still looking forward to sharing part of my experiences there with you. I know that this blog post is not “African” per se; but this post is about people, food and culture. Some of the things that interest and endear me most about Africa are those same three things: people, food and culture. So, here is my perspective on a wedding I had the privilege of attending last month. Anyone who has travelled at all knows what role food plays in culture. I’ve eaten food from a fair number of countries and am always interested in how foods are eaten. Some are finger foods by design; with others one asks how anyone could manage to eat it with their hands and not a utensil. As an Eritrean, I’ve often enjoyed seeing Westerners eat at our table for the first time. Awkwardly posing the question in their head of how on earth they are going to manage to get a meat sauce to their mouths without making a disastrous mess of the whole thing. This brings me to the recent experience I had at a French table. I was reminded of something that foodies around the world have always known: Food is culture. Sitting at the table with friends laughing, drinking and eating is something that we all do whether in Nigeria, Lesotho, Canada or France. I’ve lived in a few countries and travelled a bit over my lifetime and that is something that never changes: food connects people. Actually, I should start at the beginning: last month, I attended the wedding of one of my favorite French cousins. We were invited to the wedding many months ago and were really looking forward to it. I could talk to you about the horse-drawn carriage, her beautiful gown or the 11th century chapel. But if you know me at all, you know that my brain often revolves around a couple of things: food being one of them! In fact, the food was classically Southern French: fois gras, pâté, couscous salad, an incredible array of cheeses… the list goes on. 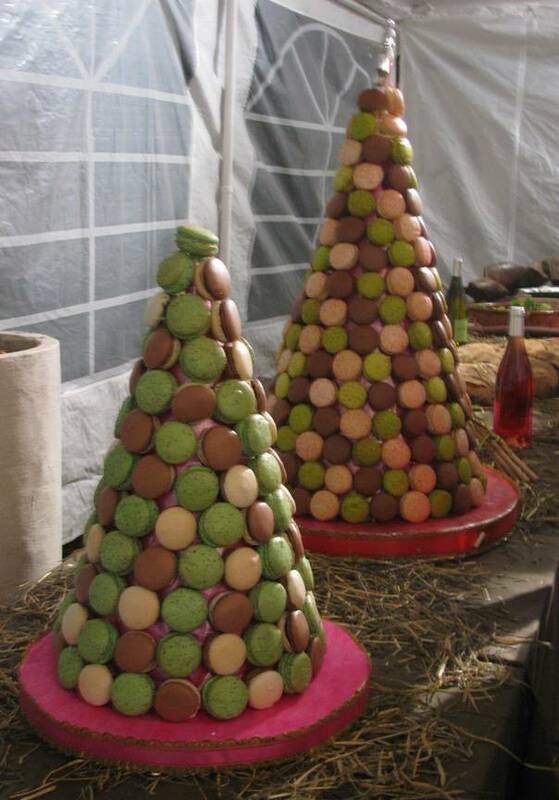 And that isn’t to mention the wedding cake: a beautiful Croquembouche and macarons in a “piece monté”. This wedding, in the small village reception hall was unmistakably French. It wasn’t a snobbish affair mind you; it was a simply elegant and stylish event. The bride was stunning, the people well-dressed. But, that slightly loud conversation which is so common in Southern Europe, the smell of anise on people’s breath (after a few glasses of Pastis, bien sûr! ), the vision of grandmothers and little children dancing together until all hours of the night… all served as typical signs that we were in the South of France in the summertime. Upon hearing of my upcoming trip, one of my dear friends, Geoff told me that he was hoping that me blogging about my time in France would help shed some light on the French for him, especially since he is from the U.K. Most of us know that the two cultures have never really managed to “get” each other. OK, fine, there is also a bit of history involved; but you probably understand what he meant. That wedding can’t be called the real France. After all, culture is complex. Expensive handbags, chic stores, the Eiffel Tower and sweet smelling perfumeries in Paris are a part of France. But for me, this charming wedding reception was my France, the France I love so much. It was family, friends, great local wine and delicious food. It was those same 20 songs that you hear at all of the village festivals that no one can help but sing out-loud while dancing until the wee hours of the morning. It was great quality local ingredients, prepared so simply that they maintain their integrity. I couldn’t stop thinking about the fact that if you changed the menu a bit and everyone spoke another language, that wedding could have easily been Spanish, Italian or yes… African. Unpretentious, people-centered and always about great food! Not fancy, overly complicated dishes; just great food and good wine. Alright, in some parts of Africa it’d be palm wine instead of Syrah; but the goal of having more people and less complicated food would have been the same. When I was young, I remember having food from all over the world. For me, the spicy, rich dishes of Eritrean cuisine often meant hearing my family chatter-on in Tigrinya. Hearty Italian meals usually meant that my dad was sipping a beer or some wine while teaching me why basil was a better option than oregano. Our Korean neighbor popped in from time to time and left wonderful Yaki-Mandu (triangular-shaped Korean egg rolls) on our kitchen table when we were away at school or work. (Remember when we didn’t even have to lock our doors?). To this day, I feel a special affinity for South Korea because I spent so many years eating Korean food with friends. It’s rather similar to Eritrean dishes in fact and somehow, learning that made me feel closer to its people too. Odd perhaps; but true. The next time you are deciding how to share who you are with someone, share your food. The next time you want to learn more about a group of people or their culture share their food. The most fun I’ve ever had while traveling has been at the dinner table. It is inevitably accompanied by laughter, jokes and sometimes even serious discussions of politics or religion. When the people bring their smiles to the table, the food always binds them to each other… no matter what is on the plate. Bon appétit et bon santé ! I found this SUPER interesting video (actually a 3 part series) today and want to share it with you all. It mentions some things that many people don’t know about Eritrean history… especially the ancient history of both the nation and the region. Best of all, it cites all of its sources in each slide so that you can either confirm the information or decide to dig deeper if you read something of particular interest. I must admit that its a little clunky as videos go (not always enough time between slides to read and digest all of the information). But I found that over all, it was definitely worth the patience needed. I was interested to learn some more details concerning the Eritrea-Europe connection. 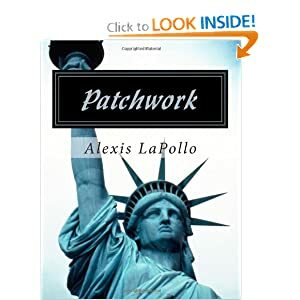 We often hear much about the colonial period (both Italian and later English influences); but learning more concerning the connection to ancient empires such as Greece, Rome and the more recent Russian link were fascinating. When most of us think of Africa in Europe, Spain isn’t the first country to pop into mind. True, those who have a fair knowledge of Africa know about their early colonization of what is now the Western Sahara, Equatorial Guinea and part of Morocco. But, there is so much more to Spain’s connection with Africa; sometimes direct, sometimes less so. Spain’s connection with Africa started way before colonialism. In fact, as early as the 7th century, there were “close ties between Africa and the Iberian peninsula. Many African monks fleeing the wars or the persecutions traveled to Spain with their manuscripts, where they organized centers of monastic learning, which were important for intellectual activity in the kingdom of the Visigoths. Africa contributed much to the preservation of ancient learning, even though the region itself was seized early from the people of the West.” (Manuel pratique de latin médiéval by Dag Norberg, Paris, 1980, English translation by R.H.Johnson). 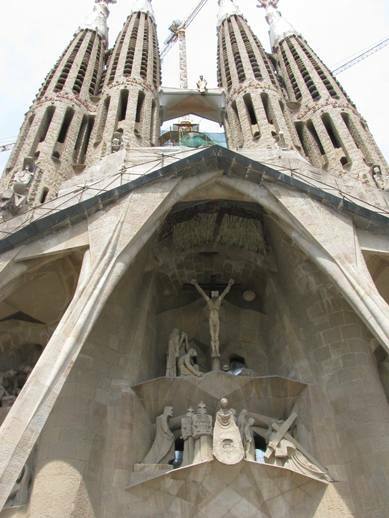 Gaudí dedicated the last 12 years of his life totally to the construction of the Sagrada Familia. In his personal life he seems to turn his back more and more on the earthly world and turns more to the spiritual world which is clearly visible in the building activities at the cathedral. On June, 7th 1926, he died and the work on the cathedral is still ongoing based in large part on his vision and sketches. Even for me, an amateur of architecture, it was apparent that Gaudí, like many of his contemporaries (of the modernist period), was heavily influenced by African art. From the Moorish influence in the interior to the pivot-like towers, Africa is present in the incredible architecture of the Sagrada Familia. I also learned that that in 1892 Gaudí made a design for the catholic mission at Tanger where the pivot-like towers appear for the first time. Yes, another African connection. But, Barcelona is more than the Sagrada Familia (even if a major focus of tourism in the city). 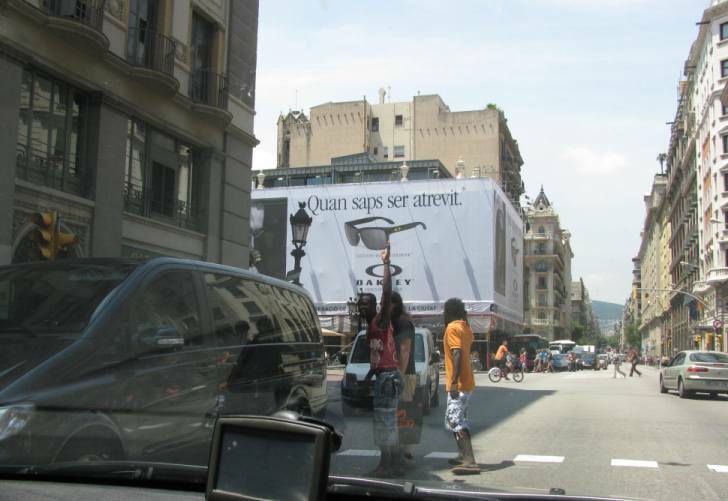 What about day to day life in Spain today? I have some Spanish friends who return home regularly from the United States. Over the years, I have heard more and more about the influx of immigrants from former colonies in South America and their influence on modern Spanish culture. But, I didn’t hear much about African immigrants to the country. 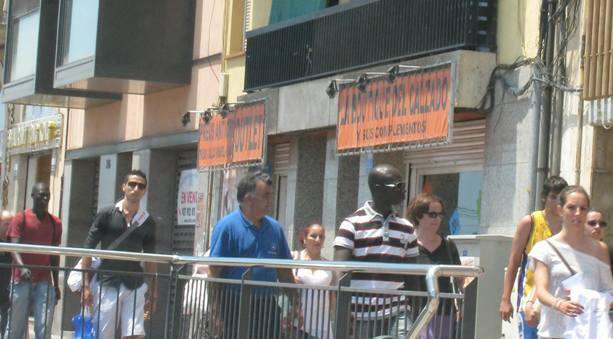 In previous visits to Spain, we’ve spent more time in the countryside than in the city and that is probably why I was so surprised to see so many African faces in Barcelona. From the metro to the city streets, there were young African faces everywhere. When driving to find a parking space, I spotted two young African men crossing the street. One of them noticed me looking with a smile and stopped to wave hello. He was almost hit by a car, which he rapidly proceeded to hit the top of and yell something in Spanish to. I couldn’t help but laugh and think of the fact that it’s often the same wherever I travel: When two Africans spot one another in a place they don’t expect to… we often smile and communicate to each other, without speaking a single word… how happy we are to have found “family” among the crowd of passers-by. It is something I’ve noticed in every country I’ve ever visited, large city or small town alike. My French husband says that it’s the advantage of being able to so easily recognize one’s own people. I think he’s right. So, whether you are heading to Spain on vacation or you are interested in teaching your children about African influences on European culture… know that Spain in general and Barcelona in particular is a great place to look for clues about the historical and current Africa-Europe connection. ¡Viva España! And may God bless Africa! Last week, we packed up most of the family, my giant puppy and 15 pieces of luggage and headed to France for the summer. Once at LAX, I noticed something that I rarely pay any attention to; but picked up on immediately since deciding to document a bit of the Africa-Europe connection for the blog: African faces make up a part of the truly French experience. When we reached the Air France counter at LAX, (our 4 carts stacked high with luggage in tow), I was greeted with the huge smile of a man who says: “Bonjour Madame! Ou allez-vous avec ce petite famille et un chien si beau?” Now, to those who are not francophone or who haven’t lived in France that would have been a nice airline employee asking if he could help. 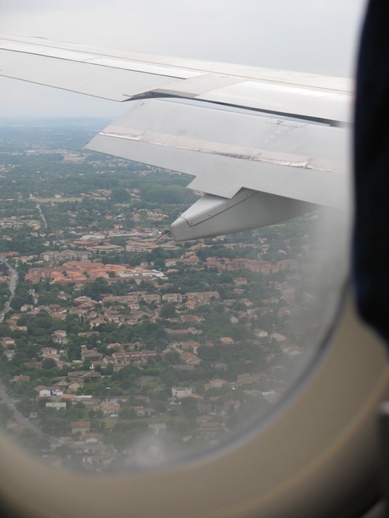 But to me, who immediately recognized the accent and knew that generally speaking, that level of engagement with strangers is a no-no in French culture… I was secretly entering the France-Afrique connection a bit early. He asked me where I was from and I knew instinctively that he didn’t mean what part of the US. I answered Eritrea and he smiled even bigger. You see, it was his job to tell me what counter to check in at, period. And had he been most (there are always exceptions!) employees of Air France- or any other large company for that matter- he’d have done just that. But, once he told me that I was his sister from the East, I understood. From that point on, my family and I got a little extra kindness. He even went to get tissues to literally wipe the drool from my puppy so that he “didn’t walk around embarrassing himself in front of the other dogs”. I felt at home. Standing in that huge airport surrounded by hundreds of people passing this way and that… I was at home. This kind North African was so gracious to my family and my giant puppy that you would have thought he’d invited us into his home for tea. He petted the dog each time he passed by, made faces at our youngest daughter and gave our eldest a speech about finishing her studies before she even started to think about boys. He was more like an uncle than a man working for an airline who just happened to be on duty when the doors to Terminal 2 opened. Many people imagine France as a land of white Europeans who walk around the streets of Paris looking chic and smoking cigarettes. Yes, that is a part of France. But, like all things, France is multidimensional, layered and complex. And this kind man from North Africa is a part of the France I know and love so much. He is part of the African face of Europe. Not the young thug who acts like an idiot on the to the train or metro, not the terrorist who goes off to Pakistan from London to join al Qaeda, not the man who forces his wife to wear a veil… but a smiling happy and kind man who calls France home and said to my husband as we walked away after thanking him for being the one who began our journey to France with such incredible kindness: “C’est normal après tout… entre Gaulois”. This experience marked the beginning of my quest for Africa in Europe… and it happened while still on American soil. I’ll be blogging more of my adventures; so keep in touch! An interesting reference to the special relationship between French natives; which he clearly felt despite his African origins. He clearly felt completely tied to French culture, not just citizenship.